This year saw a particularly good turn out on the Cornish 100. Over 100 riders set off into a breezy Cornish spring day, jerseys of every hue making a splendid display around Pendennis head and beside the Falmouth beaches before the main business of the route. A stiff Sou’westerly was noticeable on the route down to Longrock, but provided some welcome assistance on the climb out of Gweek and on the route back to Falmouth. There are links to the results lists below, and pictures of the events on the Falmouth Wheelers site. 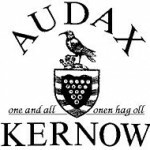 This entry was posted in Completed Events 2015, News and tagged A Cornish Hundred, Bunny Hop. Bookmark the permalink.